This paper proposes an integrative view of the marketing concept (i.e., the ability to understand and satisfy customers) and examines its prevalence and effect on competitiveness in organizations operating in an isolated and less economically developed country. The marketing concept manifests as marketing expertise, market orientation, and externally directed organizational values. 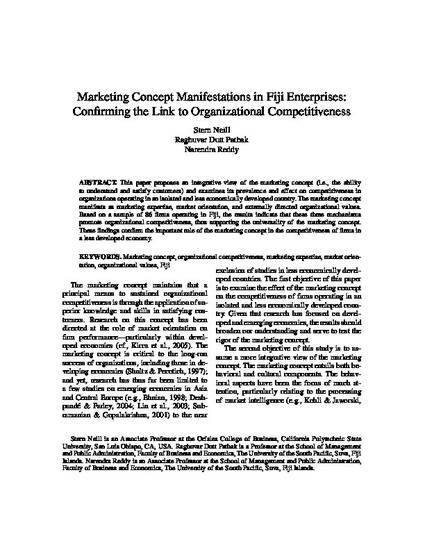 Based on a sample of 86 firms operating in Fiji, the results indicate that these three mechanisms promote organizational competitiveness, thus supporting the universality of the marketing concept. These findings confirm the important role of the marketing concept in the competitiveness of firms in a less developed economy. This is an electronic version of an article published in Journal of Global Marketing.